I spend good money on my helmets. It's the only thing protecting my dashingly good looks from getting up to bad-breath range with the pavement underneath me. And, though I do appreciate having my trusty head-saving friend, I do occasionally wish that it wouldn't be so awkward to carry around with me when I run in the bank. For years, I've stuck my helmet on the seat of my bike, hoping that no one would see it unprotected and walk off with it, leaving me to wonder if it found a good home, or if it is going to be used as a flower pot. Biker's Choice seems to be on the same page. They have a chrome-plated motorcycle helmet lock that can be mounted almost anywhere on your bike, and it's not going to stand out and look like a lump on the log when you're done installing it, too. 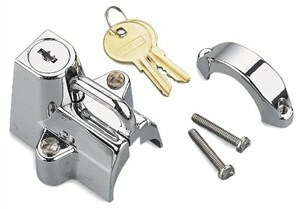 It comes with all the mounting hardware that you need, and two keys (always a good idea to keep a spare). All isn't lost if it's a little loose around when you're done mounting it, too. Because of the clamp design, all you need is a little bit of spare rubber (like from an old inner tube). Take a small strip and wrap it around the bar before you clamp the Biker's Choice lock on. It'll take out any extra slack.